A lot of diseases start from inflammation. There are many scientific experiments proving that Lingzhi can be effectively used to handle inflammation (as you can see from my posts over the last 2 months). This means Lingzhi can be used to handle diseases. Apart from being able to achieve very good anti-inflammatory results, Lingzhi is excellent to balance the 3 major systems in our body - Nervous system, Endocrine system and Immune system. These 3 systems affect the organs in our whole body. 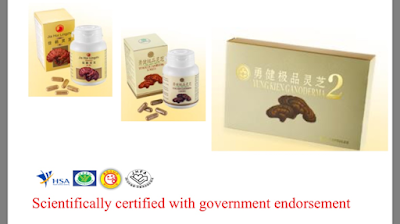 Thus when Lingzhi regulates these 3 systems well, it improves the health of all the body organs. Do you know that not all Lingzhi are the same? For it to be able to achieve this effect, it must have the components called Triterpenoid and Macromolecular Polysaccharides. It must go through a manufacturing process involving extraction, concentration, purification and vacuum freeze drying in order to preserve these components. Further, it must also pass the product safety and effectiveness test, as endorsed by credible independent third parties. The quantity of triterpenoid and macromolecular polysaccharides must be of a minimum level before the Lingzhi can be released from the factory. Numerous Ganoderma lucidum products are sold in the form of dietary supplements in the United States. However, the quality consistency of these products based on their label ingredients has seldom been evaluated due to the lack of a suitable toolkit. In the study above which was published in 2017, 19 batches of G. lucidum supplements sold in the United States were evaluated based on their bioactive components. 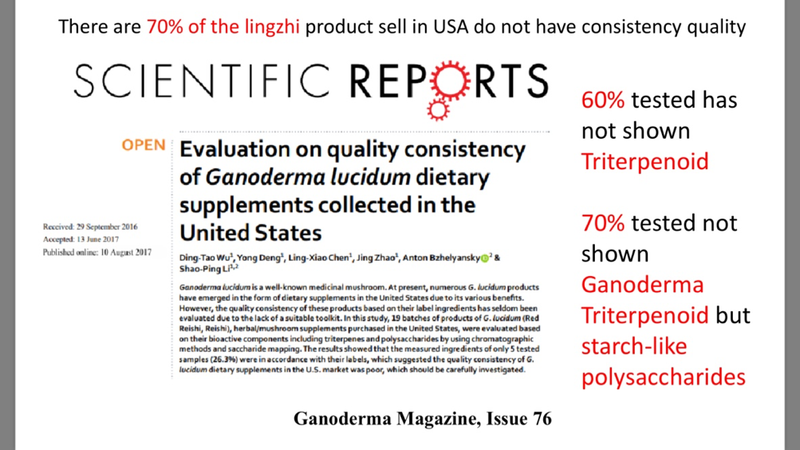 The results showed that the measured ingredients of only 5 tested samples (26.3%) were in accordance with their labels, which suggested the quality consistency of G. lucidum dietary supplements in the US market was poor. 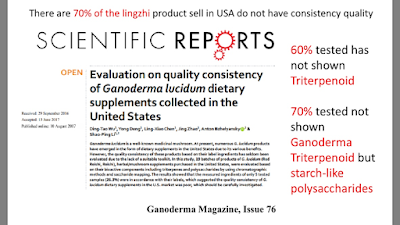 It was found that 60% of the Lingzhi tested does not contain triterpenoids, and 70% of the samples tested contain only starch-like polysaccharides. Fortunately if you are consuming Shuang Hor Lingzhi, you can have total peace of mind. All of Shuang Hor's Lingzhi have undergone stringent testing. All the required ingredients are intact. That's why these products can be in the market for 30 years and growing stronger. It is your solution for handling fatal diseases, or you can simply take it as prevention and maintenance of your good health. It is highly recommended for Lingzhi to be paired together with Yung Kien Pollen because they complement each other. Lingzhi works directly to kill pathogens and bee pollen nourishes the body with nutrients and makes Lingzhi work more effectively. Look out for my next article - you will find out how to identify high quality pollen and how does it compare to the overwhelming amount of supplements available in the market. Please email askfuiping@gmail.com to order Shuang Hor Lingzhi. I am the Authorised Distributor.